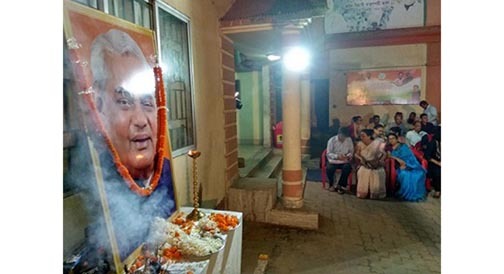 The demise of former Prime Minister Atal Bihari Vajpayee has been deeply mourned by all sections of people and political parties across Assam and the Northeast. Former Prime Minister Vajpayee, who had been admitted to the AIIMS hospital in New Delhi for the past few weeks, died at 5.05 pm on Thursday. He was 93. Sonowal also tweeted, “A statesman, ideologue, icon and one of Independent India’s greatest leaders, Vajpayee ji’s resolute leadership transformed India and gave us wings to dream big and achieve.” He also stated that it was late Vajpayee during whose tenure initiative was taken to establish the DoNER Ministry to boost development of Northeast. Assam Irrigation Minister and BJP leader Bhabesh Kalita also condoled the demise of Vajpayee. One of the founding members of the Jan Sangh in 1951, Vajpayee became its president in 1968 following the death of Deendayal Upadhyaya. Vajpayee was the first BJP leader to be sworn-in as the PM and the first non-Congress PM to complete five-year term. The demise of Vajpayee has also been condoled by the Assam Pradesh Congress Committee (APCC) president Ripun Bora and the leader of the Opposition in the Assam Legislative Assembly and leader of the Assam Congress Legislature Party (ACLP), Debabrata Saikia. Saikia also said that Vajpayee was admired and respected by his political opponents because the former Prime Minister had always placed national interest above party interest. As Prime Minister of India, Vajpayee had not hesitated to remind the then Chief Minister of Gujarat, Narendra Modi, to discharge his ‘Raj Dharma’ in the wake of the infamous riots in that State. Assam Agriculture Minister and Asom Gana Parishad (AGP) president Atul Bora, AGP working president Kashab Mahanta have also expressed condolence at Vajpayee’s demise. Both Bora and Mahanta have already left for Delhi to pay last tribute to the former PM. The president of the All India United Democratic front (AIUDF), Maulana Badruddin Ajmal has also deeply mourned the death of Vajpayee. In a condolence message Ajmal stated that with the demise of Vajpayee, India has lost an able personality. “Atal Bihari Vajpayee was an able and visionary politician,” stated Ajmal. Meanwhile, Meghalaya Chief Minister and National People’s Party (NPP) president Conrad K Sangma has also mourned Vajpayee’s demise. According to information, August 17, 2018 has been declared holiday as a respect for the former PM. Nagaland Governor PB Acharya in a condolence message said the whole nation is deeply saddened to hear the demise of Vajpayee, who was the Prime Minister of India for three times. “He was the first non-Congress Indian Prime Minister to serve a full five-year term,” the Governor said. “I am fortunate and blessed as party worker to have close contact and had guidance for a long period of 20 years with late Vajpayeeji,” Acharya stated. In his passing away, the nation has lost a statesman, a great human being, a poet, tall leader and above all a patriot, the Governor said and prayed that the departed soul rest in peace. Born on December 25, 1924 in Gwalior, Vajpayee was elected 10 times to the Lok Sabha. He was twice a Member of the Rajya Sabha in his career. The mortal remains of former PM Vajpayee have already reached his residence in New Delhi, say reports. The Central Government declared that the national flag would be flown at half mast for seven days across India and State funeral would be accorded to Atal Bihari Vajpayee. As per reports, all Delhi Government offices, schools and other institutions will remain closed on Friday.